There are only two weeks left to enter the Many Languages, One World® 2017 contest! Submit your essay today! For full contest rules and more information about MLOW 2017, click here! Watch the video to see how Many Languages, One World 2016 has changed winner Tallulah Bur’s life. 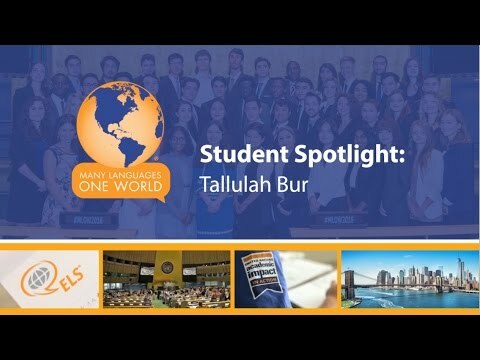 Tallulah, originally from Australia, participated in the 2016 Many Languages, One World Contest and Global Youth Forum and was a member of the Spanish language group. Since participating in Many Languages, One World (MLOW), Tallulah has been in contact with the School of Languages and Cultures at her university, the University of Sydney. She and the school are working to encourage high school students to participate in language study while at university. “My success in the competition has allowed me to deepen my ties with my university and hence work with one of the world’s leading educational institutions to spread the importance of multilingual ability,” said Tallulah.